In this Oct. 24, 2016 file photo, the HealthCare.gov 2017 website home page, as seen in Washington. 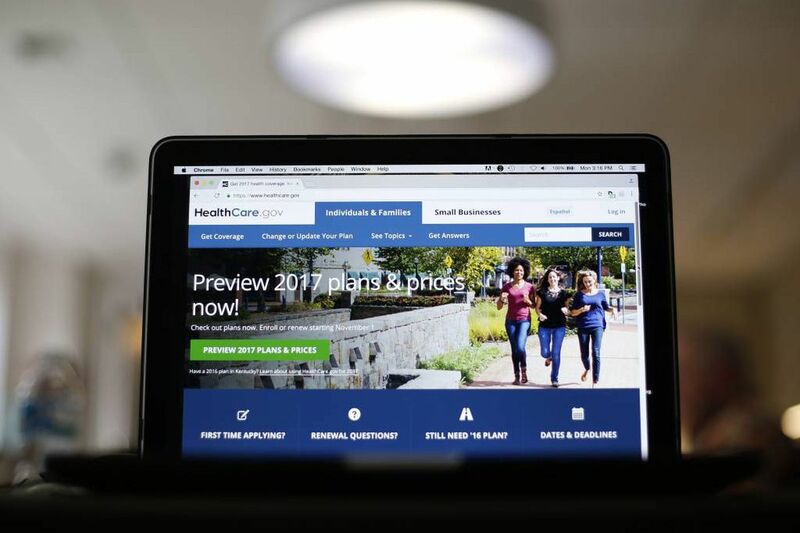 Premium rates for health insurance plans sold through the Affordable Care Act marketplace are going down in 2019, but Philadelphia-area residents who bought plans with a tax subsidy last year may be in store for sticker shock when they receive their renewal notices. Individual rates in Pennsylvania will decline an average of 2.3 percent, which is good news for people who pay the full cost of their insurance without help from the income-based subsidies established by the ACA. But as rates come down for some plans, so will the federal subsidies for most ACA consumers, and that could mean trouble for people who want to keep the plan they now have. Open enrollment is Nov. 1-Dec. 15 for plans that take effect Jan. 1. "I'm pleased that the rates and increased choices will provide consumers with more options for insurance coverage for next year, and subsequently provide consumers with the opportunity to shop for the best option that fits their needs," Jessica Altman, Pennsylvania's insurance commissioner, said in a statement. In a Thursday call with reporters to announce rates, Altman attributed the rate decrease to the market stabilizing as insurers learn more about the overall health and expense of their members. An adjustment to how the state factors in a federal cost-reduction program for certain plans also contributed to the rate decrease. In the Philadelphia area, additional insurance carriers have also helped drive down rates. Last year, Independence Blue Cross was the only carrier to offer plans through the marketplace in the five-county Philadelphia region. Now, Centene, a St. Louis-based insurance company, will sell plans in Philadelphia, Montgomery, and Bucks Counties for 2019. "Our affordable marketplace insurance product will offer access to some of the preeminent healthcare facilities in Bucks, Montgomery and Philadelphia counties, as well as thousands of physicians, clinics, pharmacies and specialists in the region," Jay Pagni, a spokesman for PA Health & Wellness, the Centene subsidiary that operates in Pennsylvania, said in a statement. Geisinger Health Plan, which is owned by Geisinger Health System of Danville, Pa., had submitted rate proposals for those counties as well as Chester and Delaware Counties, but a spokesperson said the group ultimately decided against offering plans in the Philadelphia area. As a result, the ACA marketplace in Delaware and Chester Counties will continue to have just one carrier — Independence Blue Cross. Enrollment specialists cautioned that people should expect smaller subsidies this year, especially in the three counties where Centene has joined with competitively priced plans. Income-based subsidies are based, in part, on the second-lowest silver plan — a benchmark commonly used to measure plans from one year to the next. In 2018, the benchmark was an Independence plan that next year will be the second-most expensive of six silver plans in Philadelphia, Montgomery, and Bucks Counties. Centene is introducing three new plans that are cheaper than all but one of the Independence plans, lowering the benchmark premium and, as a result, lowering subsidies. "It's a fairly common phenomenon. It's this counterintuitive dynamic that springs from how the subsidy structure works," said Sabrina Corlette, a research professor at the Center on Health Insurance Reforms at Georgetown University's Health Policy Institute. That's why it's important for people to review their coverage — even if they like their current plan, she said. "It's incumbent on consumers to shop for that better deal every year," Corlette said. People who want to keep the plan they had last year may end up paying more for it. Consider this scenario for the most popular Independence plan, Keystone HMO Silver Proactive: The plan cost a family of four (two parents in their 40s and two teenagers) $1,617 a month this year. With an annual income of $80,000, the family was eligible for a $1,570 subsidy, bringing their monthly cost to $47. In 2019, the plan will cost a little more — $1,659 a month — but the family's subsidy will be smaller, just $1,005. That will leave the family paying $654 a month — almost 14 times more than this year. Independence will send out renewal notices with updated subsidies for 2019 in early November. Brian Lobley, president of commercial and consumer markets for Independence, said he was concerned the change in subsidy amounts members see in those packets will be confusing and could lead people to opt out of coverage. The Trump administration reduced the penalty for not buying insurance to zero dollars. "People are going to be looking at this with their disposable income and need to make some tough choices," Lobley said. More than 100,000 of Independence's members in Philadelphia, Montgomery, and Bucks Counties received subsidies, and at least half pay zero dollars in premiums because of their subsidies. Overall, about 80 percent of marketplace customers received a subsidy, according to the state Insurance Department. Altman encouraged people not to panic over the size of their subsidies. "Log on, look at your options, see what's affordable," she said. "Just because the option you're currently enrolled in has decreased in affordability does not mean there are not affordable options available for you on the exchange." But according to rates released Thursday, Independence's Silver Proactive is the least expensive silver plan, which means people who find their subsidies aren't enough to cover that plan may struggle to find another option of similar quality and value that works better, Lobley said. ACA plans are grouped into levels designated as bronze, silver, gold, and platinum. Bronze plans have the cheapest premiums, with larger deductibles and other out-of-pocket costs. Platinum plans are the most expensive and most generous. Consumers who are eligible for additional financial assistance, in addition to the premium subsidies, must purchase silver plans. People can log on to healthcare.gov beginning Nov. 1 to see what size subsidy they are eligible for. Window-shopping to compare plans is available now. When comparing plans, keep in mind that the premium is only one factor that will affect how much a plan costs. Deductibles (the amount you pay out of pocket before the plan starts paying), co-insurance (the share of costs you pay once you meet your deductible and the plan pays a greater share of costs), and co-pays (fees you pay up front at a pharmacy or doctor's office) all factor into which plan is the best value for you. If you're considering changing plans, look at how the new plan will cover your medications and whether you will be able to see the same doctors. Which medications and doctors are covered vary by plan. Centene is currently involved in a class-action lawsuit in Washington state, in which members of its ACA marketplace plan there allege the plan's doctor network was much smaller than advertised. The insurer has challenged the claims and filed a motion for dismissal. Altman said she was confident Centene's Philadelphia doctor networks are complete. As part of the rate-approval process in Pennsylvania, the Insurance Department works with the Health Department to review and verify the network of every plan seeking approval for the marketplace, she said. In-person navigators are available to help people sign up (find one near you at localhelp.healthcare.gov), but the Trump administration has slashed federal funding for marketing and consumer assistance, so don't wait until the last minute to start looking, Corlette said. If you're on your own, beware of scams, such as websites designed to look like healthcare.gov. And don't buy insurance from an unsolicited phone call. Use healthcare.gov and turn to the plan-comparison tools to see how your options stack up.